Ganesha Chaturthi is one of the most important Hindu festival in India. It is the day on which Lord Ganesha, the son of Lord Shiva and Parvati was born. The day thus marks the auspicious birth of one of the most important Hindu God. 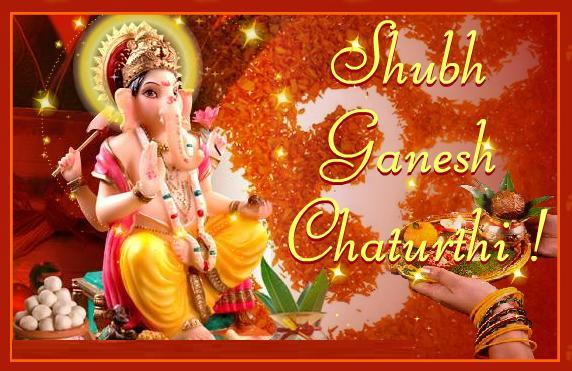 This day is also known as Vinayaka Chaturthi or Vinayaka Chavithi in many parts of the country. It is celebrated on of fourth day of the waxing moon period in the month of Bhaadrapada according to the Hindu calendar. According to the Gregorian calendar, this day falls between 20 August and 15 September. The festival is celebrated with immense enthusiasm in Maharashtra and Andhra Pradesh for ten days. If you want to explore the origin and history of this festival, you can refer to the article given here. According to the legend, the festival marks the auspicious day of the birth of Lord Ganesha. The story goes as follows- Lord Shiva, the Hindu God of resolution, was away from Kailash due to some work. As Parvati was alone at home, she felt the necessity of some one to guard the door to her house while she took bath. When she did not get any one, she conceived of the idea of creating a son who could guard her. She then created Ganesha out of her sandalwood paste and breathed life into the idol. She then asked him to stand on the gate and do not let any body enter until she came out. Unfortunately, Shiva returned home in the meantime. As, Ganesha did recognize him, he stopped Shiva from entering as per his mother's advice. This badly enraged Lord Shiva, who cut off Ganesha's head by his trident. When Parvati saw beheaded Ganesha, took on the form of the Goddess Kali and threatened to destruct all the three worlds. The earth, the heaven, the nether world, all was shaken and every body ran to Shiva for solution. In order to appease Lord Parvati and save the world from destruction, Lord Shiva sent out his followers to find a child whose mother is facing another direction in negligence, cut off his head and bring it quickly. The first such child that came in the eyes of the Shiva followers was an elephant, so they brought the head of this elephant and Shiva placed it on the trunk of Parvati's son and gave life into him. Parvati was the overwhelmed with happiness and embraced her son. They named her Ganesha i.e the Lord of all Ganas (followers).